The Emerald City Roller Girls were born in 2006 when a handful of friends heard about the revival of roller derby and decided to brush up their rusty skating skills. Word spread quickly, and ten months later ECRG had secured regular practice space, elected a board of directors, split into teams, trained though torn muscles and broken bones, and held their first bout to a sold-out crowd! Much of ECRG’s early success was supported by more experienced leagues who lent us their coaches and provided invaluable advice. In this way, roller derby provides both a local and nation-wide network of grassroots athletes who have made their leagues successful with very few resources other than hard work and creativity. ECRG is proud to be members of the Women’s Flat Track Derby Association, and can’t wait to start making a name for our league on a national level! 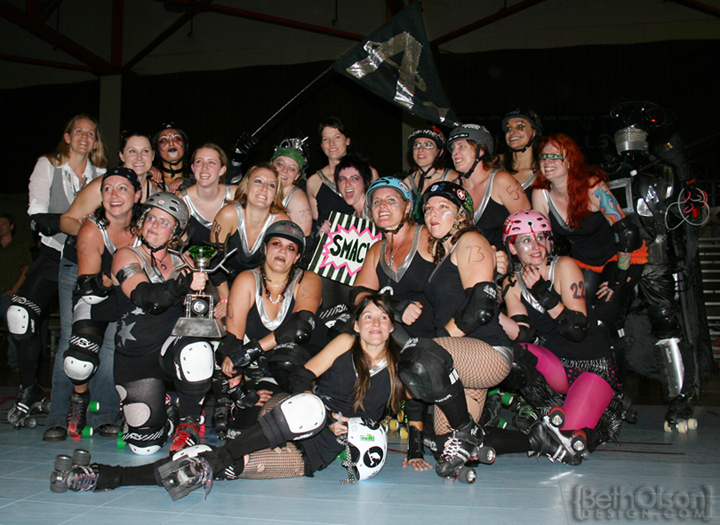 Long live roller derby in Eugene!